Our most important asset in health care is the team of dedicated and talented people who provide care. It is very important that we invest in our current and future providers to meet a growing demand for health services. 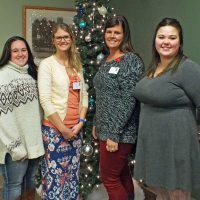 The Nursing & Healthcare Excellence Scholarships awarded through the Allegan General Hospital Foundation support and encourage individuals pursuing higher education in health care. These awards are made possible by private donations to the Foundation from generous people who care about our hospital and our community. They help ensure the skilled and dedicated professionals needed in health care are well prepared and ready to serve for generations to come. Candidates are selected based on merit, accomplishments, need, and the promise they offer as current or future members of the health care team. Scholarships are presented twice annually. Spring awards are available for graduating high school seniors from schools throughout the service area of Allegan General Hospital. Employees of Allegan General Hospital and their children are eligible to apply for healthcare scholarships during both spring and autumn rounds.